Wow! That’s harsh! I could never do that to an audience. But that man was absolutely right. They all die — somewhere, somehow. Death is probably the most challenging thing that anyone on the homestead has to face. Before we actually moved to our homestead, I suppose I thought that all of my animals would live a long happy life and then quietly die in their sleep when they were quite old. And although that has happened a few times, there have been far more deaths that were the result of a coyote attack, a parasite overload, or a disease. It’s tough enough when you’ve done everything you can do and an animal dies in spite of your best efforts. But it’s even harder when you’ve done everything you can do, and an animal is alive but in a condition that does not provide a good quality of life. That’s when you have to make the hard decisions. A little more than three years ago, Katy the llama was in the pasture and couldn’t stand. 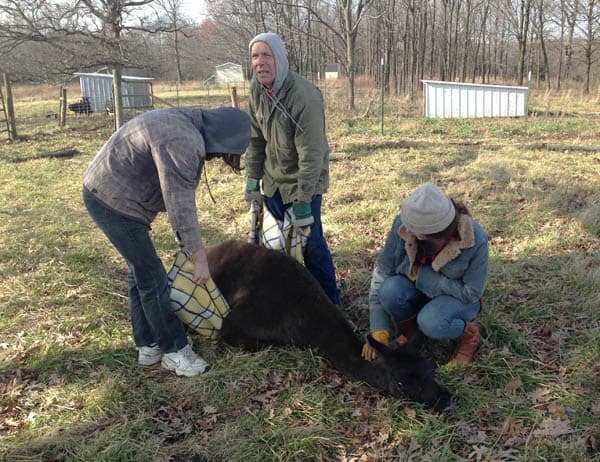 My husband and son looped a blanket under her body and carried her through the pasture, through the barn, and loaded her onto the trailer so I could take her to the university vet hospital. After a battery of tests, they diagnosed her with meningeal worm. Unlike the more common intestinal worms, these worms get into the spinal column where they do serious damage, which is why she couldn’t stand. They said her chances of survival were only about 20 percent, but since she was nursing a four-month-old cria, I wanted to go forward in spite of such terrible odds, so I left her at the hospital after signing a consent to treat with an estimated bill of $400. The next day I received a phone call that Katy had “crashed” when they started treatment, and they saved her. The bill was now more than $1,000. Katy was alive, but she couldn’t poop or pee. She had a catheter, and they were manually removing feces. They told me I could take her home. I am willing to do a LOT for my animals, but I was not going to deal with that. If she couldn’t poop or pee, then I did not want to bring her home. She stayed there for a few more days and eventually regained the ability to eliminate on her own again. However, she could not lift her tail, which meant it was getting soiled every time she eliminated. 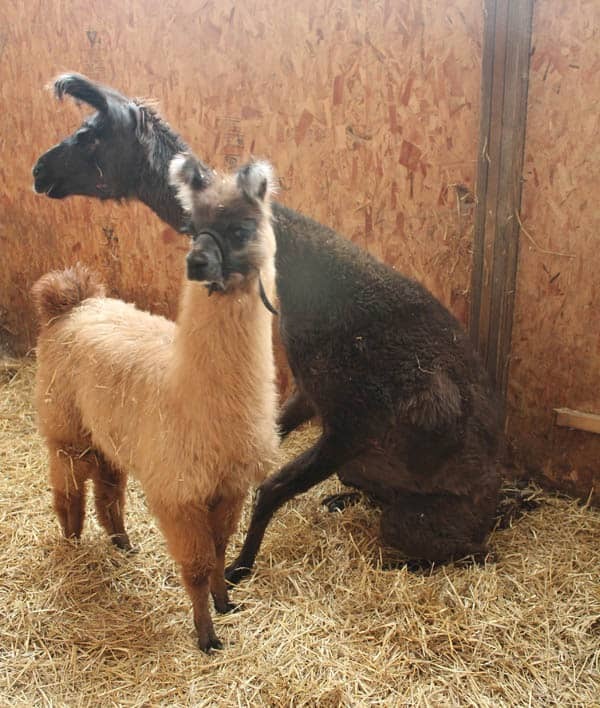 After a week in the hospital and a $1,500 bill, I brought home a llama that could not stand on her own and whose tail needed to be cleaned regularly. With us lifting her several times daily, she would hopefully regain the ability to stand on her own. Initially she improved almost daily. She went from being able to stand for only a few minutes before falling down to being able to stand for two hours. She was eventually able to take a few steps. But that’s where her progress ended, and then she started to go backwards after we removed her son from her stall. He was starting to act like a stud, so we were worried about him trying to mate her. Even without that concern, he was also knocking her down, which she did not need. For six months we continued lifting her several times a day. Finally we had to have a talk. It was obvious to everyone here that she would not ever be able to stand up again on her own. We had hoped that putting her in a pasture might boost her spirits, and although it did for a few days, it didn’t last. A few times, she walked out of the shelter and fell down in the middle of the pasture as it was starting to rain. Trying to get her into the shelter was challenging at best. It was obvious she would never again be a livestock guardian. In fact, she needed a guardian. She’d be a sitting duck for a coyote, if one got into her pasture. So, we made the very difficult decision to put her down. This was not the first or the last time that we’ve had to make a decision like this, and if you’re a homesteader, you will have to make similar decisions. Yes, the good days far outnumber the bad, but you need to be prepared for the bad days. Some people go into homesteading or farming thinking that’s it’s an idyllic life. You’ll have acres of beautiful pasture with baby animals to adore. You’ll be weeding your garden in a state of zen. You’ll be enjoying delicious meals of homegrown food. And while all of that may be true, there will also be baby animals that die, wild rabbits that eat your transplants, and raccoons that eat your chickens. If that’s too depressing to think about, then maybe homesteading isn’t for you. If you are homesteading already, what are some of the hard decisions that you’ve had to make? Share your stories in the comment section below. I know this is a strange question but what do you do with a large animal that dies? Do you have an area you use for burials? If it’s a really large animal like a llama or horse, we bury it wherever it died. If the animal is small enough to carry, we have an area where we bury them. I had just purchased a 3 acre property back in November of last year and we decided to be loving homesteaders with goats, sheep, alpacas, ducks, geese, turkeys, and chickens. We too had the initial thought that it was awesome and so rewarding, which it is and we love it; but we had to live with the harsh reality that no matter what you do above and beyond things you just cant control…this year we lost 4 to M-worm and 1 now I am soon going to have to make that hard decision! My Carl who is a 1 year old alpaca is the sweetest loving animal who protects my smaller animals and loves cuddles just went down about a week ago, he lost all movement in hind legs and front legs are almost like stuck under him, I started immediate treatment of vitamin B complex injections 4cc and ivermectin 2cc injections with a safeguard paste also some drenching. Its been 5 days and he will not get up on his own, I am in the barn everyday moving his extremities and trying to stretch him and move him, also using a hoist so he can stand, he eats and drinks and really tries to get up he just cant. I am holding on to my wishful thinking and my talking to him to fight this and rehab him to get better and it breaks my heart to have to think about the 10-20% success rate, but I am not willing to give up just yet, homesteading is a passion and a love for each individual animal who all like people have personalities, I am so heartbroken, and like you said we try our best for preventative care, but then the worms become resistant and we are always trying to change things to prevent that, the cycles are sometimes overwhelming because a lot of it is based on weather for that time of year , did it rain a lot , has it been a scorching summer, no matter how much you clean the barn or clear pastures and think they will live a happy healthy life, its always a possibility ……I am just happy to be able to have great people with knowledge and experiences to always learn new things and provide the best care for my animals….I thank you so much for your article and insight sometimes although very sad is refreshing to know you are not alone when things go wrong on the farm…thank you again just wanted to share my story and shed some light on this very destructive meningeal worm, I am in the north central part of Pennsylvania just in case you have any other articles for regions etc …..I do a lot of reading! I totally understand that you have to try. No one else will know when it’s time to give up if he doesn’t start to recover. Wishing you the best as you work your way through this. We had one down for a week. Treated five days with ivermectin injunctions, anti inflammatory shot, panacur orally. We learned with our doxies that the brain will stop sending signals to legs so you have to stimulate them. We pinched area between her toes and she responded by pulling her legs away. We did this every so many hours and my daughter even did it during the night. Serena yelled at us but you could see her brain and muscles starting to work together. After the sixth day she was standing again with minimum help and by 8th day she was up on her own walking again. Vet said if she was down 2-3 days wouldn’t get up again. She also said she probably wouldn’t be able to go back in the field with other alpacas. She is back with them showing no signs of ever being sick. I just had another one get same thing and caught earlier. Five days of treatment and he never went down. I believe the anti inflammatory shot with worm medicine really makes a difference. I also gave jump start with the meds for probiotics and extra vitamins. Within 3 weeks she was totally back to normal and now just needs to put on some weight. Wow! Congratulations! It’s really unusual for them to come back from m-worm. I’d have agreed with your vet about her prognosis after a few days. I recently had a large rabbit that somehow broke its back and lost use of its lower legs. It could not control its bladder or pooper. I cleaned and fed this rabbit for a week changing its position several times a day. I pampered the rabbit, but I could tell it was not happy. It was alot of work too. The rabbit eventually became sicker, and I was forced to make the decision to dispatch my bunny to heaven. I felt that the bunny deserved better quality of life. I’m sure that was hard, but you’re right. It didn’t have a good quality of life. Dang, as much as I hate to read some of this.. it’s plain straight true. I’ve got a sweet goat with meningeal worm that I’m still treating w/ fenbendazole, B-1 shots, anti-inflammatory and trying for her sake.. but, the writing is on the wall I’m afraid… and I’ve been uncomfortable, and glancing at guilt for thinking that maybe the best thing is the unthinkable. Thank you for this page and the other one..
You’re welcome. Sorry that you’re going through this. Luckily, most goats are resistant to m-worm, so hopefully you won’t have to deal with it again. My Pepper is a three year old boer doe that lost use of her right rear leg last thanksgiving. I took her to our vet and he felt it was neurological and meningeal worm was mentioned in the conversation, but he felt it was such a rare thing that it wasn’t pursued. A few weeks ago I thought she was going into labor, and since it was near midnight and I couldn’t find a local vet we packed her off to Ohio State vet hospital. Turns out she wasn’t in labor and they determined it was meningeal. I know I probably should have done something drastic with her, but she didn’t seem to be in any distress or pain, and I was hoping to get the kids out to help offset the cost of OSU. I think she’s really in labor right now and I’m hoping we can make it through this. It may be a long night. Worms do not go through the placenta. Most stay in the digestive tract, but m-worm does not. It goes to the spinal cord or brain stem. It also cannot reproduce within a goat or llama because they are aberrant hosts, and goats or llamas with m-worm cannot infect other goats or llamas. Can you use the meat from an animal who has had meningeal worm in the past and been treated? 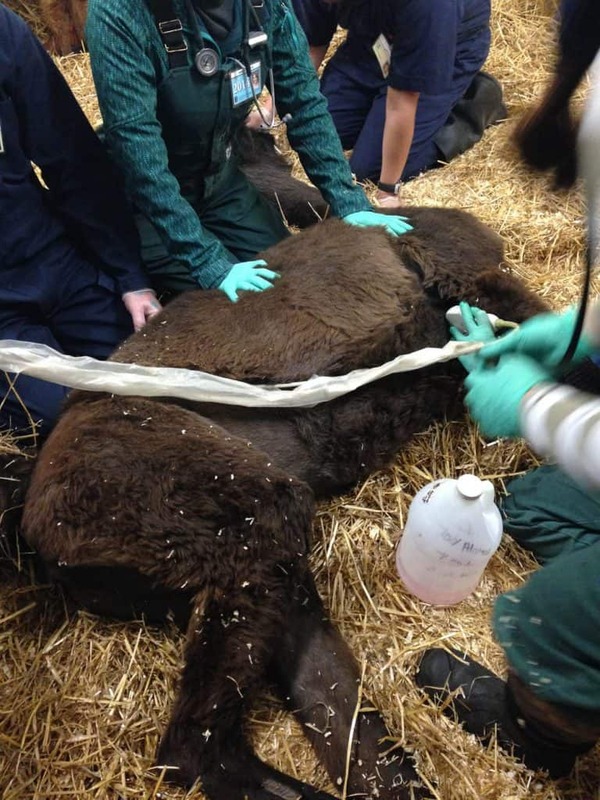 Treatment ended many months before slaughter.